When using VSTS it's recommended to use tags liberally to help with identifying and categorizing work items. Over time people will tag work items with different tags for the same purpose. For example, one developer may tag a card as v1.0 and another developer as v1 to indicate the work item is associated with version 1.0 of the software. Another scenario that leads to work items getting improperly tagged is name changes by the business. You start off tagging the work items as ProjectX and later it changes to ProjectXYZ. There is an excellent VSTS extension to help out with cleaning up tag names. Tags Manager by YodLabs. After installing the Tags Manager extension you will get a new tab on the Work item submenu. Now we can easily delete and merge tags. In our example we want to merge v8.0 and v8.0.0 to v8.0.0. Also, we want to merge v9, v9.0, and v9.0.0 to v9.0.0. If we click on the v9 tag and change it to v9.0.0 we will get the dialog box shown below. We can add an optional comment before we click the Merge button in our example. 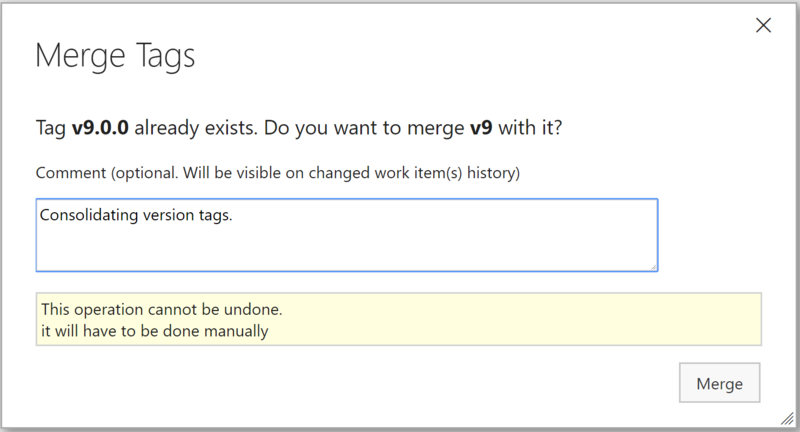 Updating, deleting, and merging tags is easy with the Tags Manager extension.